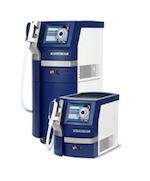 The MedioStar Next Laser System from Asclepion is a versatile option for cosmetic professionals who are looking for a high quality laser system for their diversified practice. Suitable for skin types I-VI and built to perform with unbeatable speed, comfort and an adjustable treatment area, the MedioStar is a smart choice for painless and safe hair removal. The perfect addition to any cosmetic practice that offers skin rejuvenation in addition to laser hair removal, the MedioStar Next laser machine allows cosmetic professionals to maximize functionality without sacrificing patient comfort or safety. The unit is easy to operate, and the patented cooling applicator tip maximizes patient comfort and reduces the occurrence of painful inflammation and swelling due to heat exposure. The MedioStar laser provides complete hair removal and other cosmetic treatments at the industry’s fastest coverage rate of 12 Hz. This powerful laser system provides unparalleled efficiency at a fast rate, allowing cosmetic professionals to maximize the number of client appointments they can take throughout the day. By providing faster treatments and even expanding your practice to include services like skin rejuvenation and acne treatment, you can develop your business with the MedioStar Next and take your cosmetic treatment practice to the next level. When you are looking for top of the line cooling and a coverage area that maximizes every minute spent with clients, the MedioStar Next is the ideal choice for your cosmetic practice. Take advantage of the easy to use controls and simple operation and see what a different Asclepion quality lasers can make for your business. Interested in adding the Asclepion MedioStar Next to your cosmetic treatment options? SunrayLaser.com has great deals on used Asclepion MedioStar Next laser equipment with savings that are up to 60% off the original price! See for yourself how much you can save on quality used laser equipment when you buy from SunrayLaser.com. Looking for pricing information and other details about our selection of pre-owned Asclepion MedioStar Next lasers? Please fill out the form below and we’ll provide a fast and free, no obligation quote. It’s an easy and no-risk way to learn more about this versatile and dependable line of cosmetic laser systems. At Sunray Laser Equipment we strive to be a best of breed Cosmetic Laser company. Serving the refurbished medical industry with IPL and Aesthetic lasers at significant discounts over retail costs. We pass the savings on to you, the customer. Contact us today for a free price quote on any make or model.